Squash House Quilts: The Dogwoods Are In Bloom! You probably think I’ve lost my mind….Dogwoods blooming in January? I had you going for a minute, didn’t I! A few days ago I asked you all about the designer of some Dogwood fabric I saw in the Keepsake Quilting Spring catalog here. Thanks to several of you, I found out the designer of “Dogwood” is Michelle Engel Bencsko of Cicada Studio. I ordered a sampling of the fabric which arrived yesterday. I really like it and plan to order more in another colorway. I think I will make placements and a tablerunner! Next will be picking out a great pattern for the runner. Michelle is really talented - be sure to check out her website and blog! Before I go today, Mr. Squash wanted me to clear up a misspelling in yesterday’s post. Apparently "Chatskie" is spelled: Tschotskies. He says I need to brush up on my Yiddish! Oh boy...good for you. I think you need the entire collection! The fabric is gorgeous! You are so good at putting them together! Now where are you going to pack them? 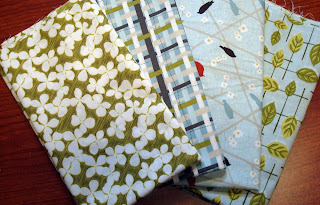 Those dogwood fabrics are really pretty - a real breath of spring!! Can't wait to see what you do with them! I just checked out the other colorway on the Henry Glass website. I love blue, but the burgundys and the pinks are just gorgeous!